In 1999, film and television producers, Kevin Burns and Jon Jashni, formed Synthesis Entertainment in order to develop and manage the intellectual properties of legendary producer, Irwin Allen (The Poseidon Adventure, The Towering Inferno, Voyage to the Bottom of the Sea, etc. ), They are currently producing an updated version of “Lost in Space” for Netflix. The test for the restoration and remastering project of all 85 hours of the Lost in Space television series. Transfer of original 35mm film elements to HDCamSR performed by Illuminate in Burbank, CA. Digital audio restoration from original magnetic sound elements performed by Sound Services, inc., Los Angeles, CA. For the first time ever, the timeless journey of Irwin Allen’s LOST IN SPACE is available in glorious Blu Ray! Follow the heart-racing, cliff-hanging adventures of John Robinson and his family aboard the Jupiter 2, along with Robot B-9 and the delightfully devious Dr. Zachary Smith. 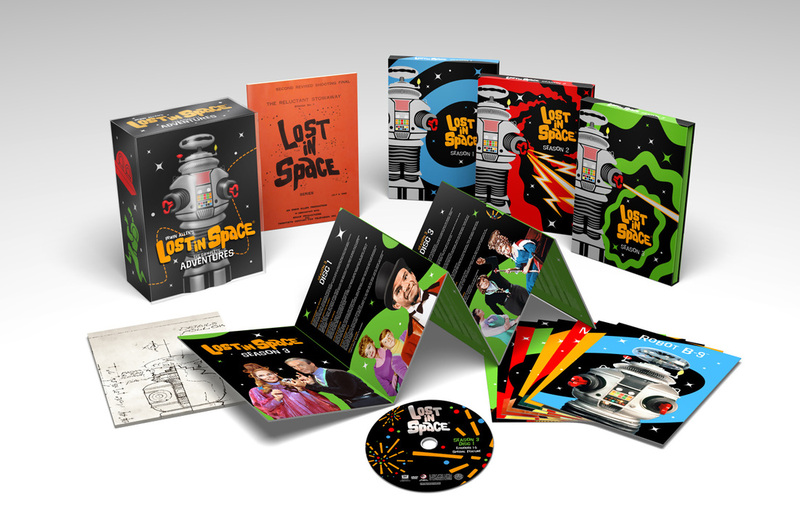 This massive 18-disc set contains all 83 episodes remastered in high definition, and loads of exciting extras with recently discovered content you won’t find anywhere else in the galaxy. It’s out-of-this-world fun for everyone! © Synthesis Entertainment 2016. All Rights Reserved.